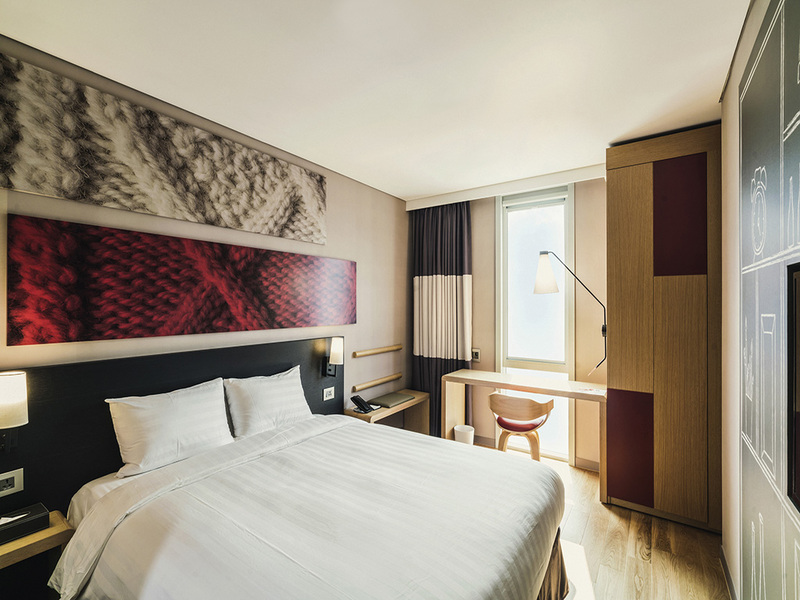 ibis Ambassador Busan Haeundae is 6 minutes by foot to Haeundae beach in Busan. It is also near the subway station and Busan Exhibition and Convention Center. The hotel offers contemporary rooms featuring the signature Sweet Bed by ibis, a restaurant, bar, gym, meeting room and free WiFi. Enjoy our breakfast from 4 am to midday. Perfect for business and leisure travellers. It is located near the city centre which makes it an ideal location to travel and explore Busan. Bujeon Ginseng Market and Semyun Underground Shopping Center are easily accessible from the hotel and only a 30 minutes drive to the airport. Located on the southeastern tip of the Korean peninsula, Busan enjoys four distinct seasons and a temperate climate that never gets too hot or too cold. The natural environment of Busan is a perfect example of harmony between mountains, rivers and sea. Offering innovative and varied cuisine to satisfy all your cravings, whether it be for something sweet, savory... or both! Good Location near beach and market. Staff friendly and helpful. The view of the ocean was great. The room was a little larger than I had originally anticipated, which is awesome clean and comfortable.Good location can walk to subway ,Haeundae beach and Haeundae market. The smiles and courteous manners of the reception staff made our arrival and stay a pleasant one. Good hygiene and cleanliness. A minus was the elevator. There were 3 coach load of guests checked in one evening. More than 50 people were waiting for 2 small elevators. Very cozy hotel. Likely to use again. Very clean, quiet, and comfortable room. It was a clean and cozy room and very comfortable place to stay. One point that I am not satisfied is the noise of machine sound. I am quite sensitive to get sleep and could hear the noise at night. But beside that, everything was good enough. Clean and tidy room, not huge but it sufficient for two guests with large size baggage each. All basic facilities are provided. Staff are friendly and efficient. great and nice hotel to stay..
the hotel location near by the beach, with some shop nearby. nice location. nice and friendly staff. only need a staff at the ground floor as the lobby located in the top floor. people may get confused find the lobby. i got room with the view of the beach.. really nice.. Excellent! The room is very comfortable! I enjoyed every bit of it. From the warm welcome to the perfect bed to the great view of the ocean. One big hair found towel. Otherwise perfect. Clean( although one long hair dangling from the towel rack, which isn't what you want) nice facilities, check in staff were incredibly friendly and quick and just perfect at their job. 5 mins walk to haeundae beach, lots of restaurant and cafe around the this area. love the bed. I had a pleasant stay at Ibis Haeundae, go the room upgraded with living room. It is the best Ibis I have visited in the world. Great for sleeping and dropping by a home base while exploring haeundae or busan.